Anticipation remained high Wednesday, September 21st. Hi! I am Zachary Fenell back behind the keyboard. 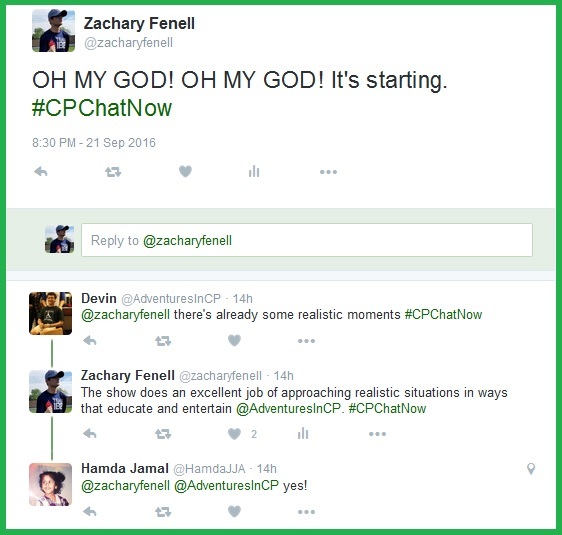 As #CPChatNow co-host I wish I could credit all the bursting excitement to our Twitter chat. However, the premiering Speechless deserves some dues. Speechless stars Micah Fowler, a young actor with cerebral palsy. The show follows his character JJ and his family the Dimeos as they live life and deal with JJ’s CP. This includes JJ’s siblings Ray Dimeo (Mason Cook) and Dylan Dimeo (Kyla Kenedy). Each family member receives fitting screen time, at least in the pilot episode. Anyways, I am not here to critique Speechless. Rather I am tasked to recap our latest Twitter chat. 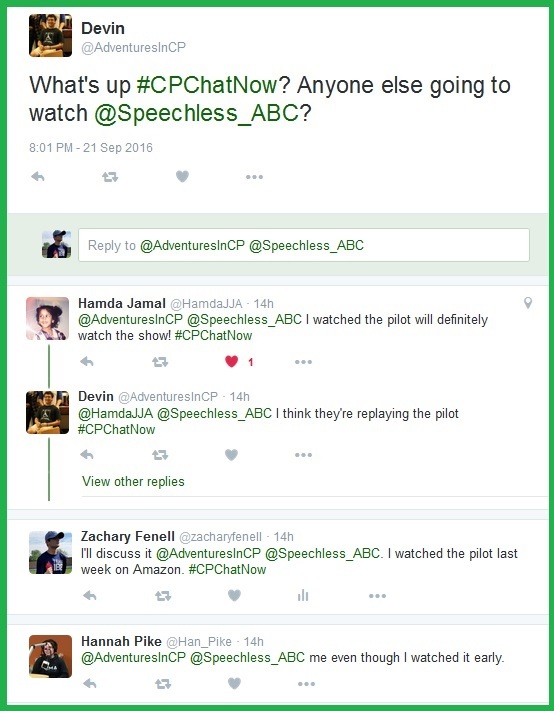 I mention the show because early on conversation centered on the subject. 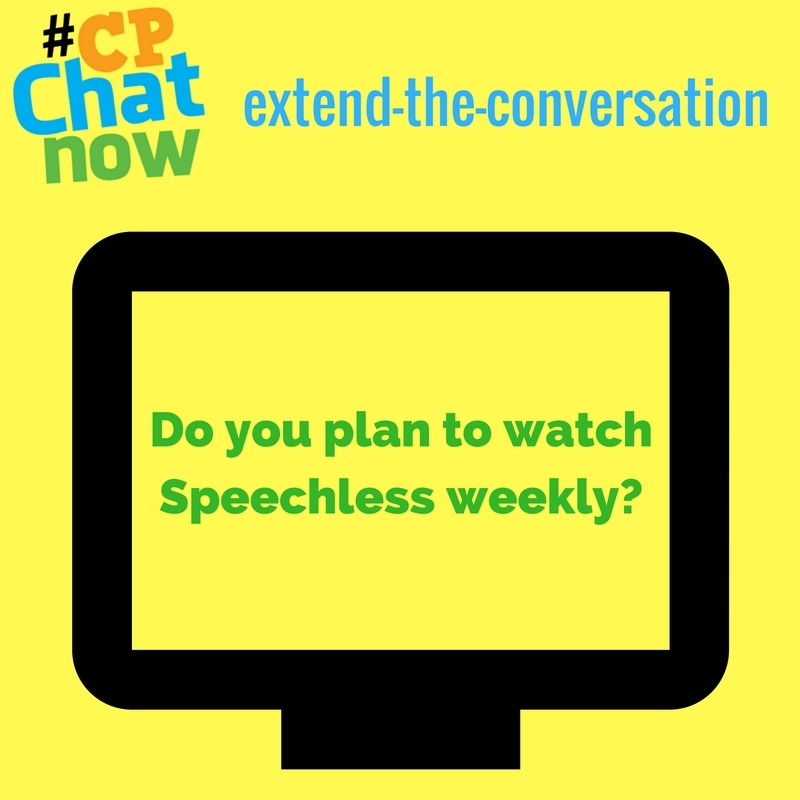 While anticipation for Speechless remained high, we managed to discuss other topics. 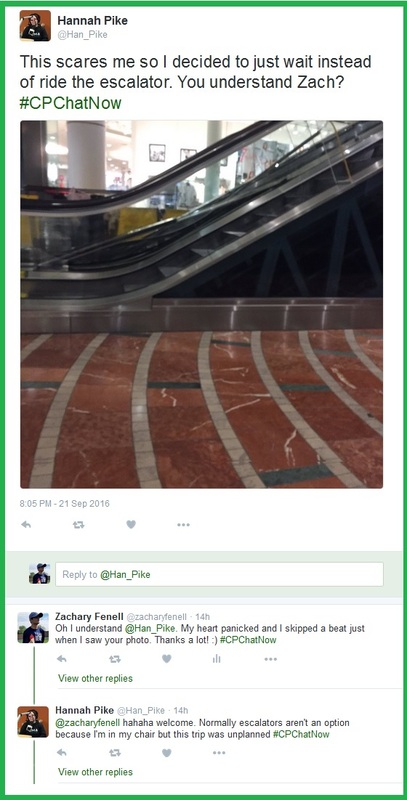 Community regular Hannah Pike shared a photo which escalated the dialogue. Half an hour into the chat the conversation returned to Speechless. Leave your reply via a comment in the “Comments” section. First though, continue reading the recap. In our second hour I posed a question which triggered chatter. 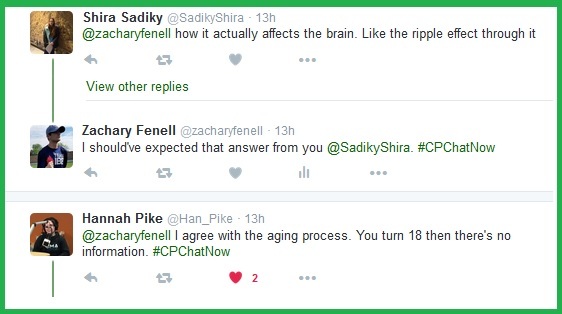 Most people displayed a curiosity in how cerebral palsy impacts the aging process. One certainty with aging involves seeking advice and emotional support. 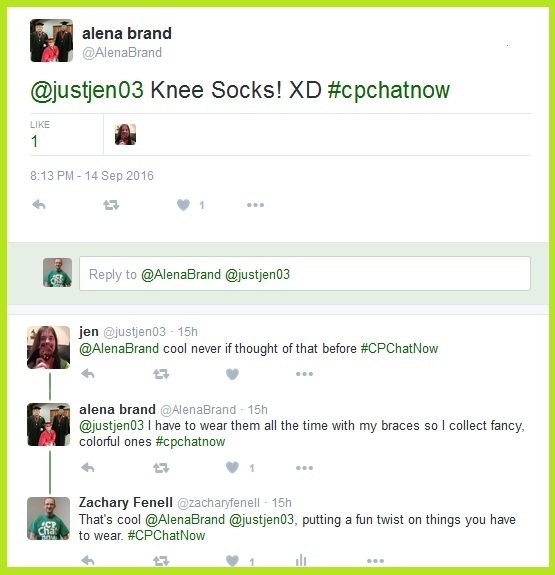 Items #CPChatNow can provide. 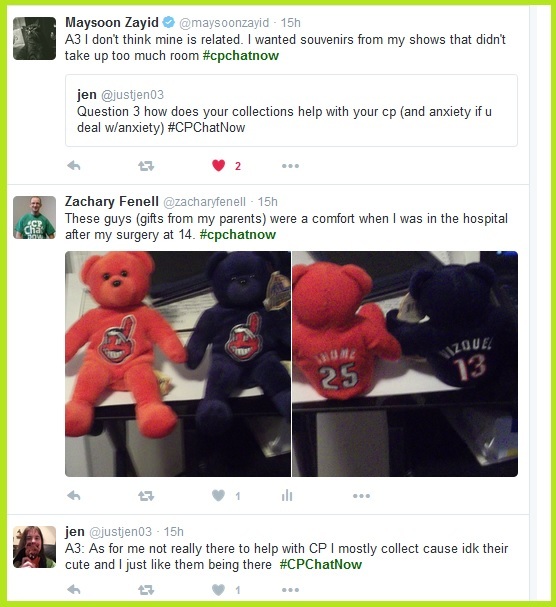 If need advice on life with cerebral palsy, join our Twitter chat Wednesdays, 8pm ET. 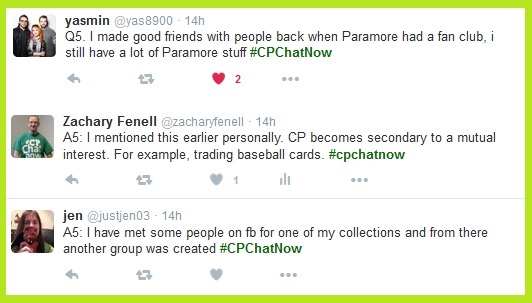 Or, checkout the #CPChatNow Facebook fan page. Message us so we can discuss posting your question to the Facebook page. Respond by commenting below. Talk with you later. 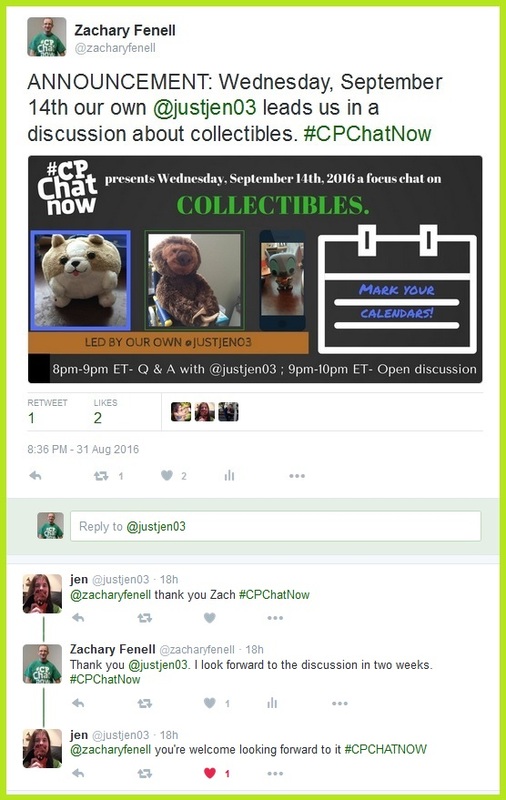 On Wednesday, September 14th, 2016 we in the #CPChatNow community gathered on Twitter for a focus chat about collectibles. I am co-host Zachary Fenell, ready to compile highlights into your weekly recap. Enjoy! 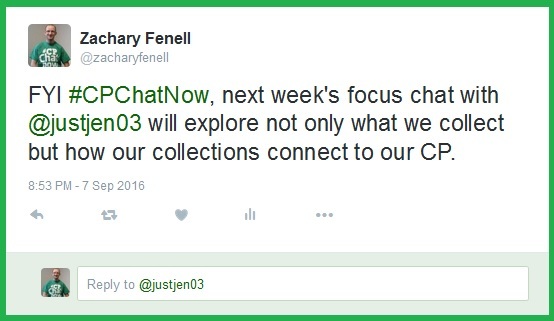 #CPChatNow focus chats mainly fall into two categories. External focus chats feature a guest outside the community. For example, Danielle Kerani who led our August mental health focus chat. 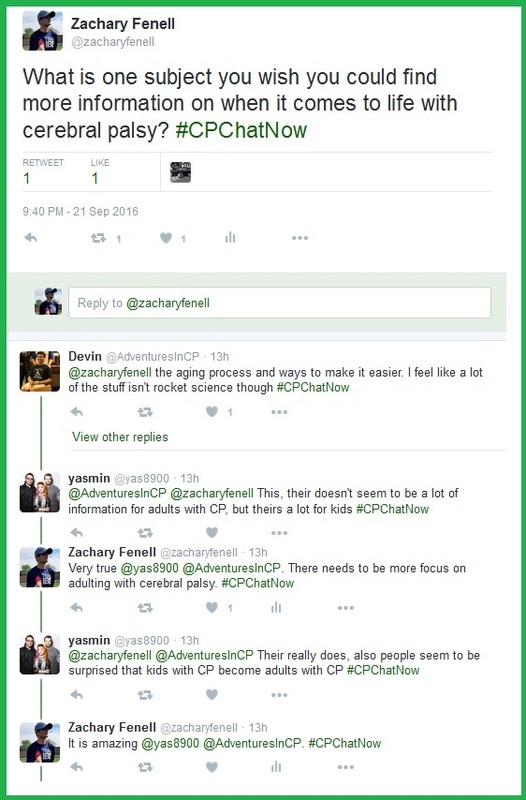 Meanwhile internal focus chats promote the expertise within our own community. Personally, I love the concept. Everyone possesses expertise on some subject. Internal focus chats recognizes said knowledge. 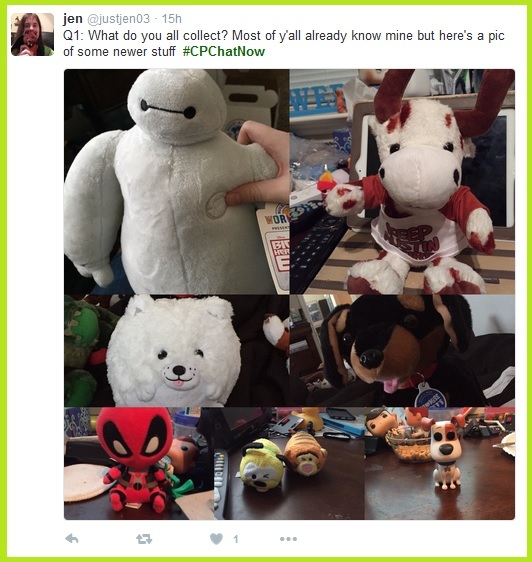 For September our very own Jen led a chat on collectibles. 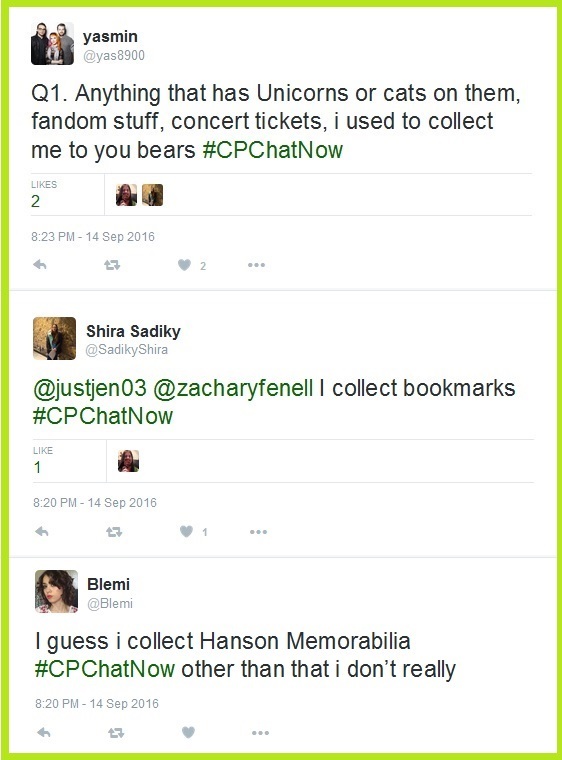 Jen’s experience and passion for collecting gives her all the credentials needed to lead the chat. To begin she asked what people collect. Like Jen, a couple people incorporated pictures into their answers. Altogether answers showed great range in interests. One participant specifically, Alena, turned a cerebral palsy issue into motive to start her collection. Your turn to contribute to the conversation! 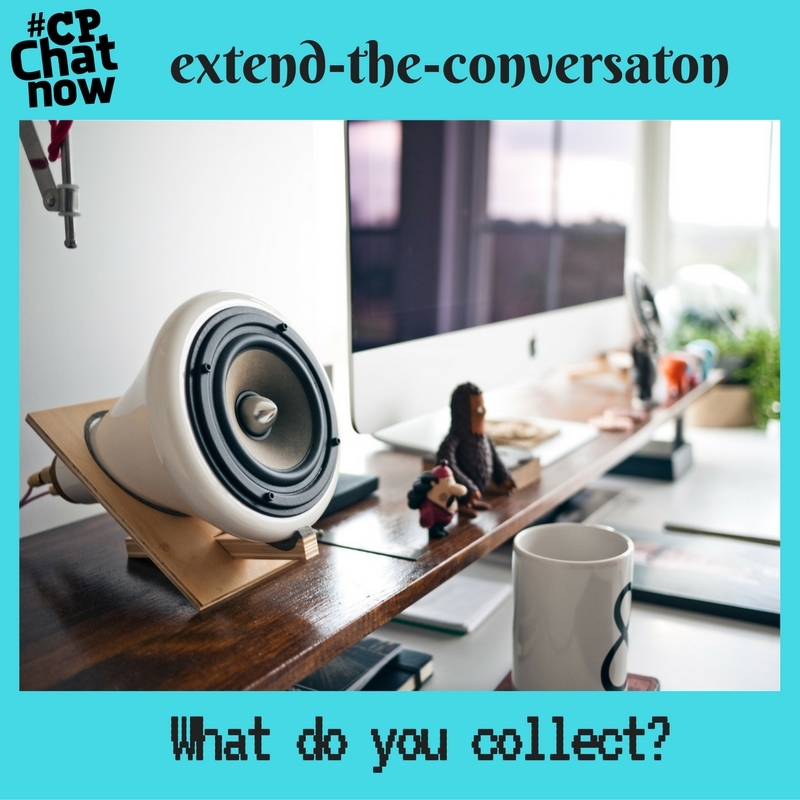 Answer for the week’s extend-the-conversation question, “What do you collect?” Respond in the “Comments” section. Alena’s response foreshadowed Jen’s third question. Most people found no correlation. In fact only I deemed my collections helpful. The second part to my response raised an issue Jen’s fifth question addressed. This time everyone’s answers proved similar. As always, answer by commenting below. P.S. If you hold interest in leading a focus chat, please contact my co-host Blake Henry and I to discuss details. Excitement stirred throughout the evening Wednesday, September 7th, 2016. 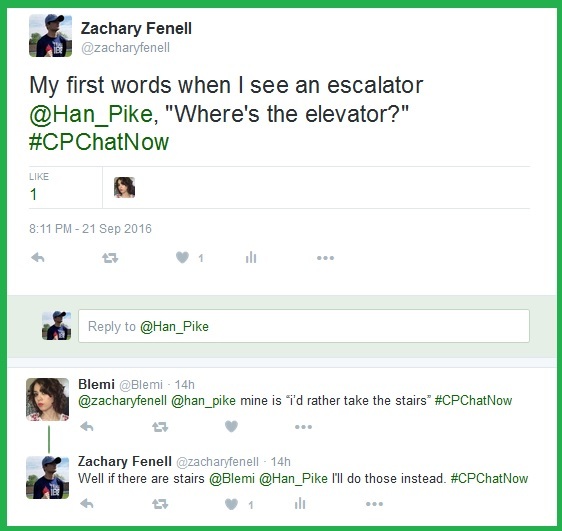 I am #CPChatNow co-host Zachary Fenell, ready to compress all the excitement into a weekly recap. 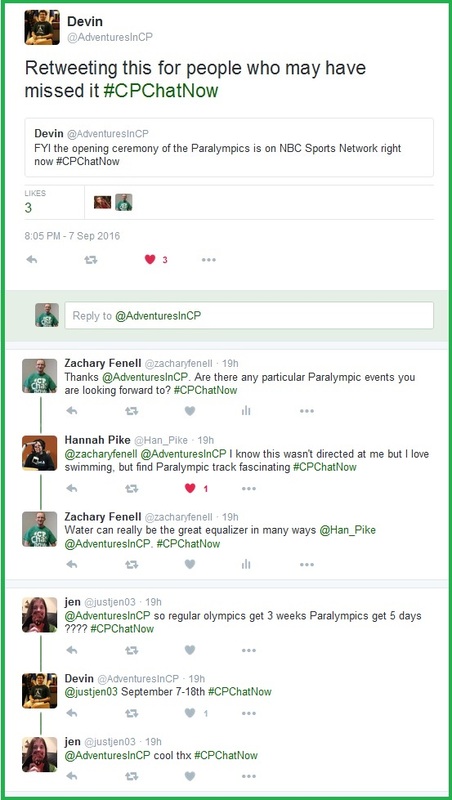 This week’s Twitter chat coincided with the 2016 Paralympics opening ceremonies. Naturally the conversation drifted to the games. Now while I directed my question to Devin, anyone could answer. So let us open up the floor. 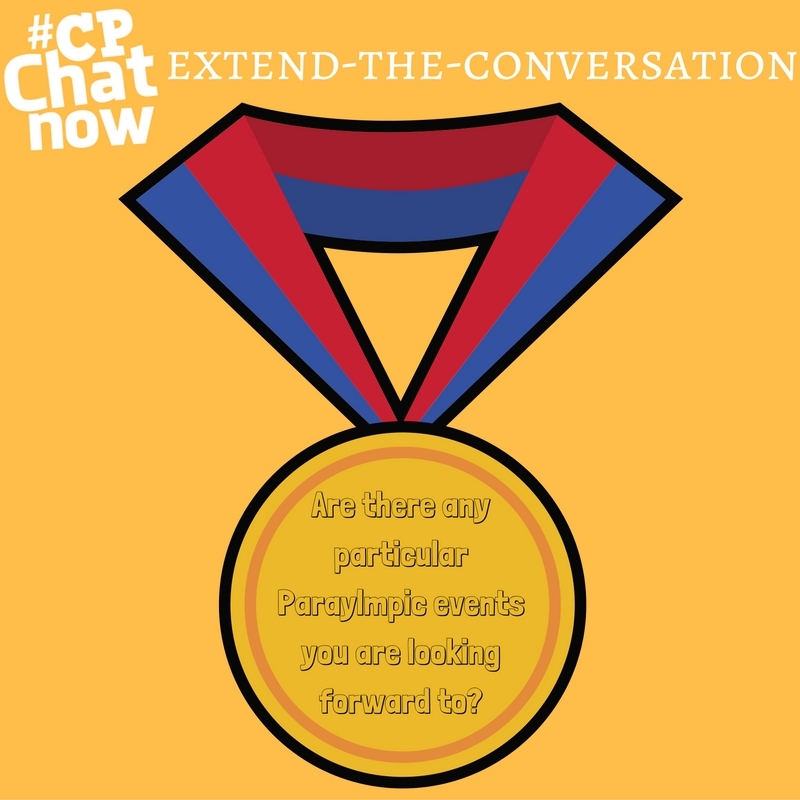 Answer for the week’s extend-the-conversation question “Are there any particular Paralympic events you are looking forward to?” Leave your response in the “Comments” section. 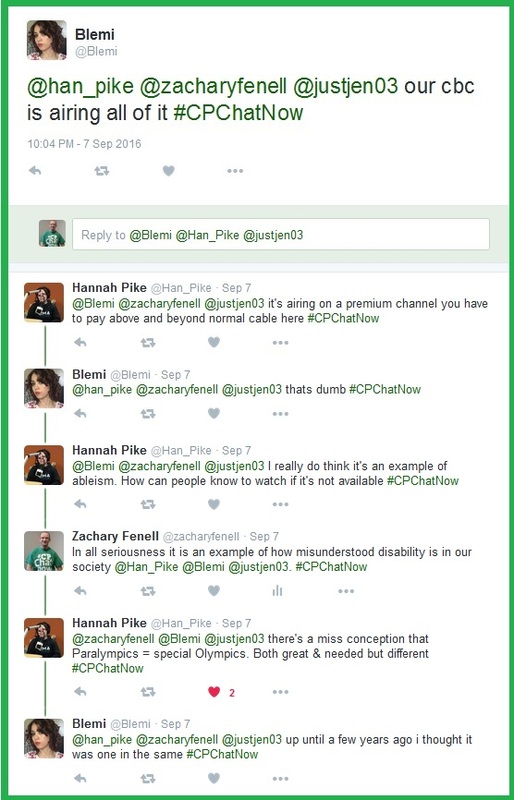 Discussion went beyond the Paralympics too. I sparked dialogue with my greeting by asking about lessons learned this week. 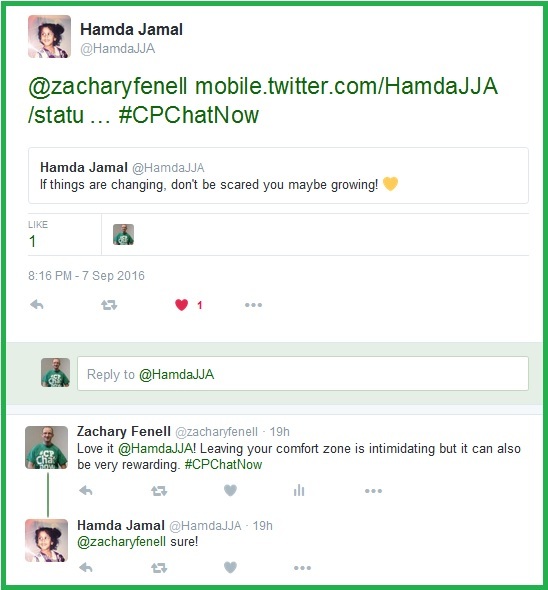 Hamda’s reply led to detailed talk about leaving comfort zones. Additionally I shared some community news, officially announcing our September 2016 Google Hangout date. Google Hangouts gives our community a chance to chat face-to-face using web cams. Please contact me via a Twitter DM with any questions on how to join. 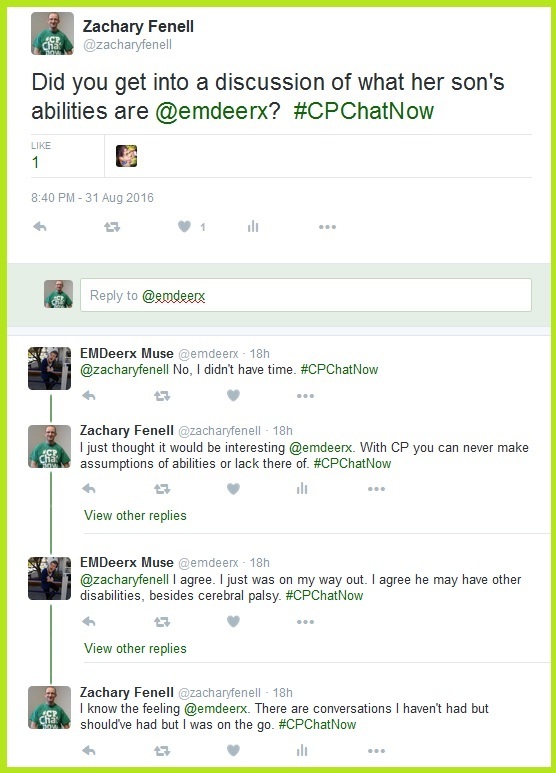 Glancing ahead next week looks eventful for us at #CPChatNow. 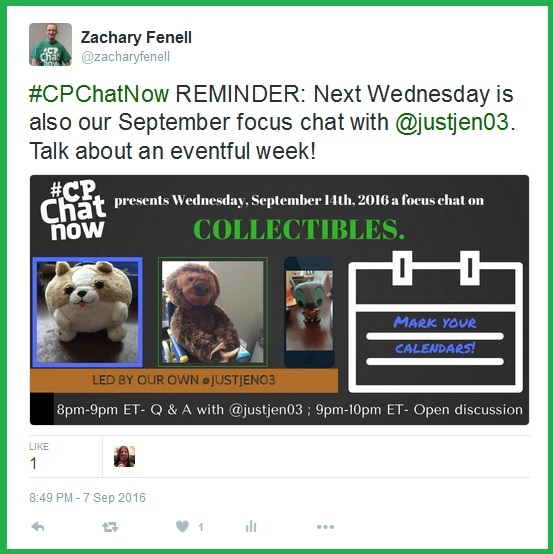 You may recall Wednesday we hold September’s focus chat. A chat our own Jen will lead! Before starting a countdown to September 14th and September 15th though, allow me to finish recapping this week’s Twitter chat. 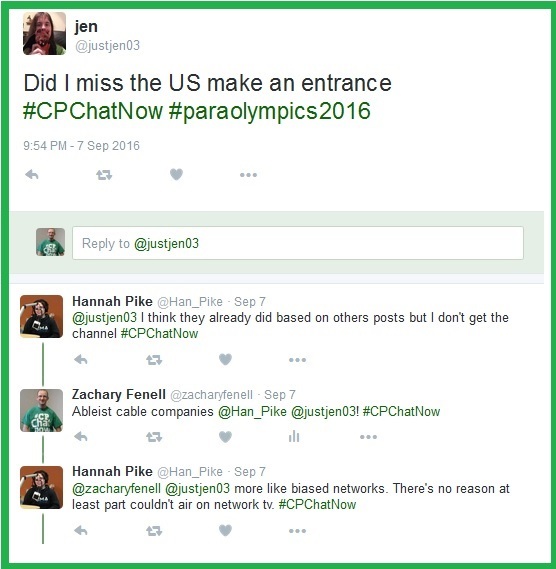 Towards the chat’s end conversation returned to the Paralympics. 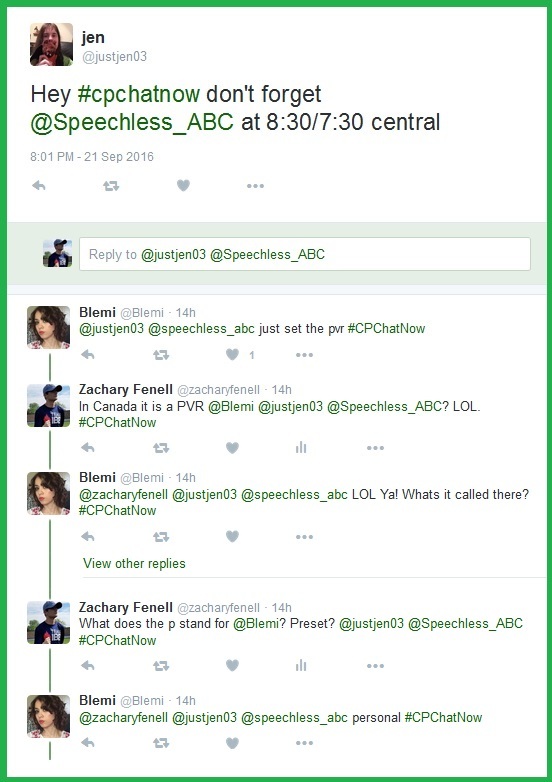 Honestly, like Blemi I did not always know the difference between the Paralympics and Special Olympics. However, I quickly learned in 2012 when writing the following blog post, “Debunking Misconceptions: Paralympics/Special Olympics Confusion.” Feel free to pass on the post to help educate others on the differences. Current events sparked much dialogue during our August 31st, 2016 live Twitter chat. I am co-host Zachary Fenell and you can probably guess why I am here. Yes, to bring you our weekly recap! As I previously mentioned many conversations Wednesday evening revolved around current events. 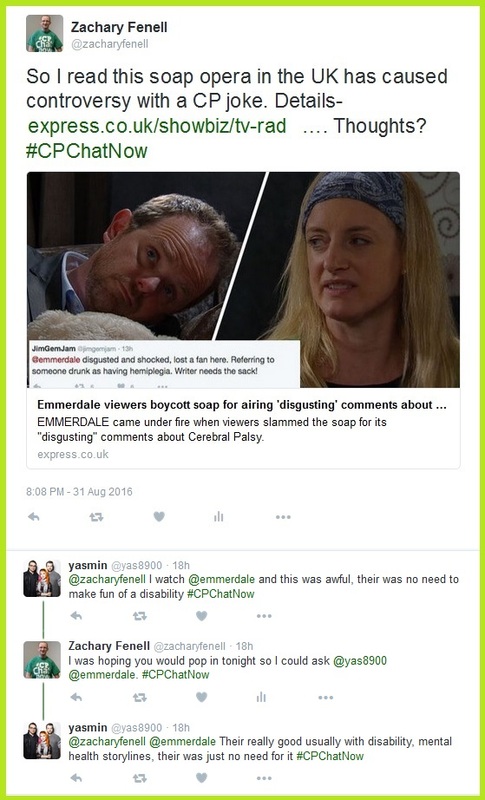 For example, the UK soap opera Emmderdale caused controversy recently. 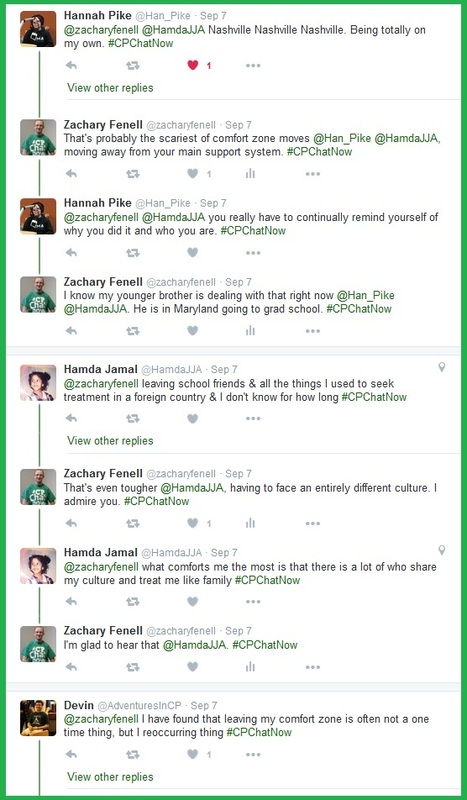 #CPChatNow’s international presence came into play with the Emmerdale discussion. 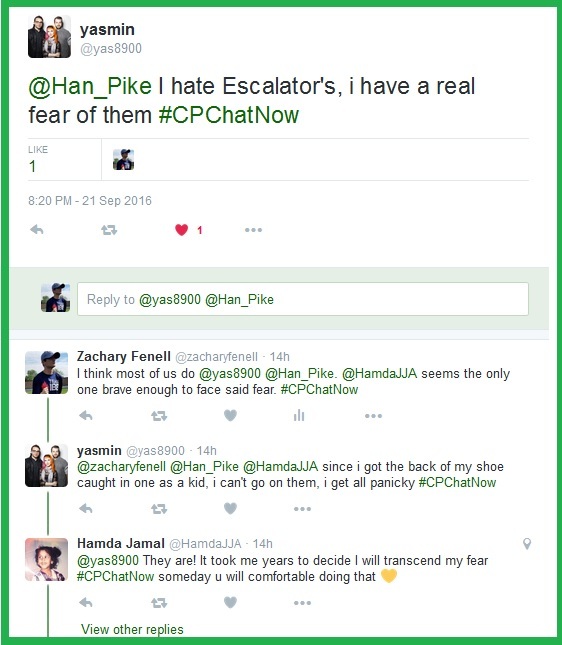 Chat frequenter and UK resident Yasmin contributed a knowledgeable opinion, like the above screen shot shows. 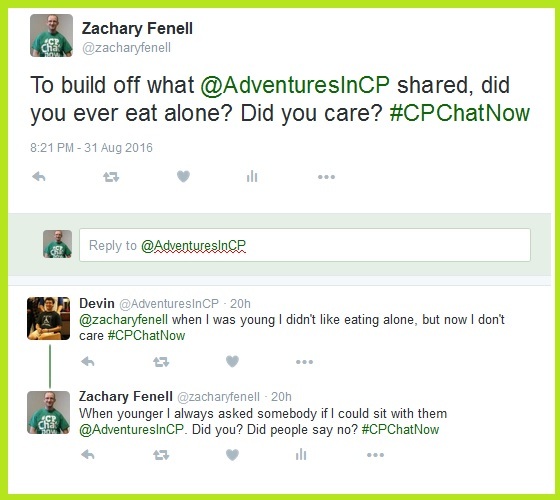 Another chat regular Devin brought up a current event a little closer to where most participants call home. Again, I imagine you want a live link to the news story. 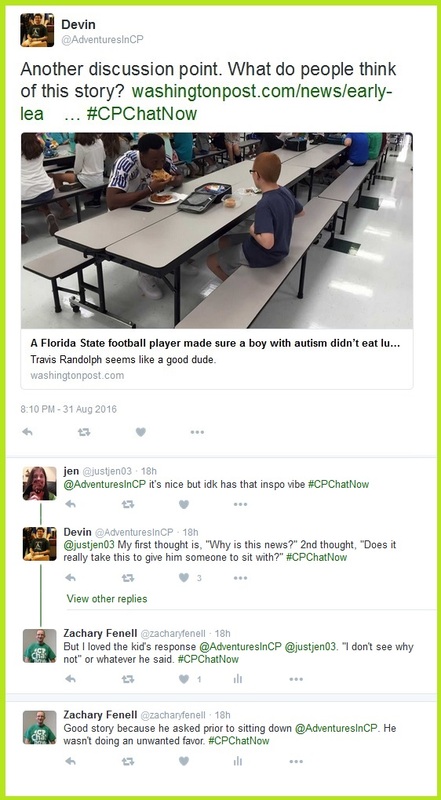 “A Florida State football player made sure a boy with autism didn’t eat lunch…” Personally intrigued by the story Devin shared, I asked a follow-up question. Honestly, my inquiry did not stimulate the dialogue like I expected. Maybe other talk overshadowed the question. Time to find out. 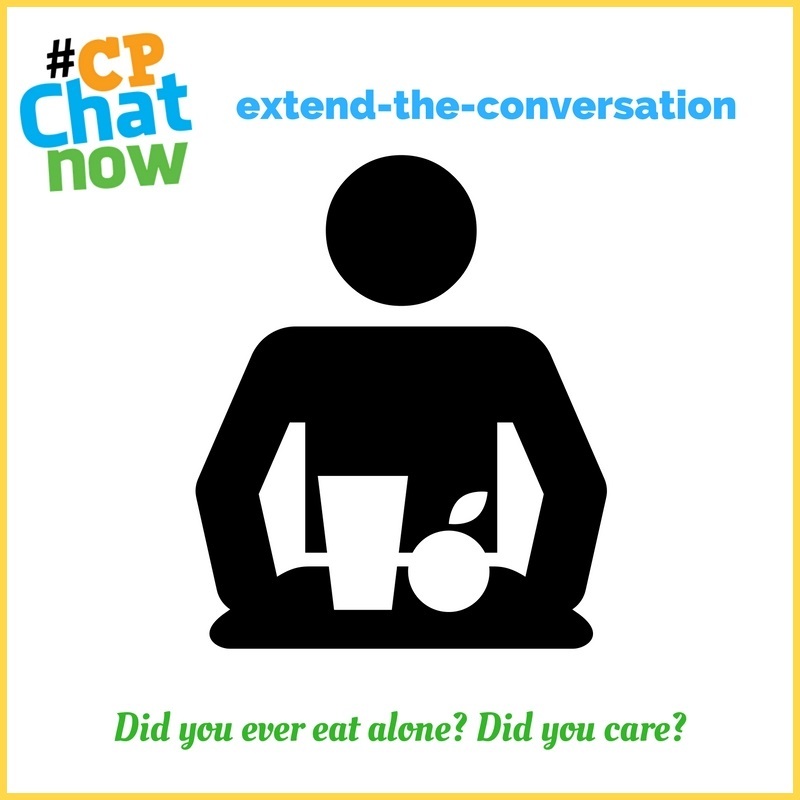 Answer for the week’s extend-the-conversation question, “Did you ever eat alone? Did you care?” Respond in the “Comments” section. Resuming recap mode, the current events orientated discussion transitioned from news stories to events in our own lives. 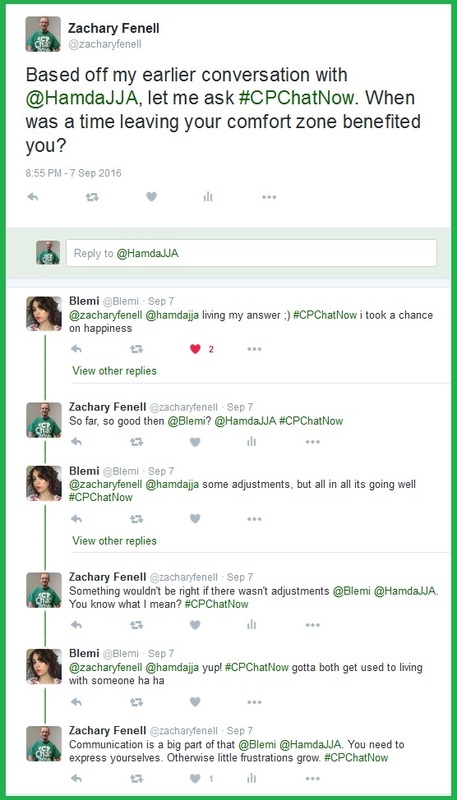 The announcement for our September 2016 focus chat unofficially initiated the transition. Make sure you mark your calendars for Wednesday, September 14th. Prepare to share what you collect. Perhaps you will even discover a cerebral palsy connection. Cerebral palsy played a role in an interaction regular Erin dealt with earlier in the day. A mother approached Erin to tell her about the mother’s son with cerebral palsy. The encounter raised questions regarding expectations. Often for me such conversations come while I train for my half marathon. I hope though, through participating in different races I am making cerebral palsy more visible. 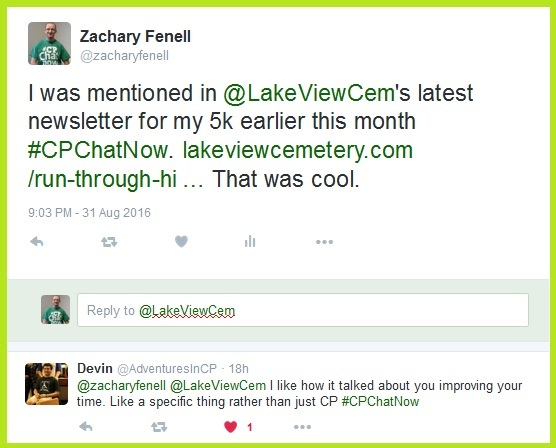 Lake View Cemetery, where I completed my most recent 5k, mentioned me in their latest newsletter for instance. Thank you for reading the week’s recap. Remember to answer the extend-the-conversation question. Leave your responses below in the “Comments” section. Then join us Wednesday, September 7th at 8pm ET for our next Twitter chat. If you don’t tweet, come interact with us on our Facebook fan page.